Thin and small are key technological trend together with performance upgrading. However, on the other hand, additional challenges are required to develop new type of magnetic parts that meet with issues arising from downsizing, namely unnecessary mutually interfered noise due to high-density mounting. For this purpose, nowadays, many kinds of electromagnetic wave absorption materials, or various plastic sheets with dispersed magnetic powder , are sold for noise measures. Some MHz to GHz noises from digital circuits are absorbed and changed into thermal energy in those materials. However, their shielding effect is not fully effective because their permeability is as low as around 100. Toshiba Materials Co., Ltd. has developed amorphous magnetic shielding parts with high permeability. Our magnetic shielding parts are similar with others in appearance. But their performance and application are unique. They work in the lower frequency range of some ten to hundreds kHz. They are applied to shielding parts to absorb leakage of magnetic flux from coils and magnetic components. Or they can make themselves into thin sheet-like cores of inductors and transformers because they have high permeability. When a metallic body is located in the vicinity of a coil, magnetic fluxes of the coil cross the metallic body and make eddy current in it, which generates heat in it or degrades Q factor of the coil. Therefore, measures are required to be taken to magnetically isolate coils. Our sheet parts have advantages in shielding effect, permeability and low loss, not to mention their thinner-profile. They are especially suited to shielding parts for planer portable devices. We have two types of shielding parts; one is high permeability type (SS series) and the other is high Q factor type (DS series). SS series have an excellent shielding effect as they have high relative permeability of 12,000 at 100 kHz. DS series have an excellent Q factor as they have a low loss characteristic and have a relative permeability of 2,000 at around some hundreds kHz. 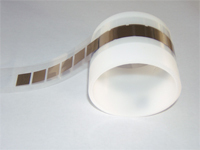 Both types use 16 µm thin amorphous magnetic material. PET protective films are applied to their both sides having adhesive layers between them. The sheets are as thin as 0.09 mm. We can offer our sheets in many shapes up to 46 mm by maximum width other than rectangular sheet. We can deliver them mounted on a carrier tape. Shielding parts with other type of laminated structures are also available. RFID, smart keys and low frequency radio devices including wave clocks.